Julia A. Shearson is a Cleveland Ohio activist. 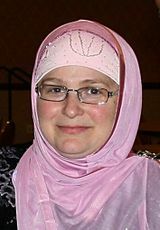 After helping open the Cleveland office of the Council on American Islamic Relations in 2003, Shearson "joined local interfaith efforts, serving on dialogue teams with ministers and rabbis." Before joining CAIR, Shearson taught for 10 years, and has traveled extensively in Europe, East Asia, and the Middle East. She received her BA in East Asian Languages and Cultures from Columbia, a Master’s in Linguistics from Ohio University, and a Master’s in Middle East Studies from Harvard University. Raised Catholic in Geneva-on-the Lake, Julia Shearson converted to Islam after her postgraduate work at Harvard. Her daughter's father, Ahmed Muhammad Alaai, lives in Saudi Arabia. ""This case strains credulity. We don't have all the information yet, but on the face of the complaint, it looks like [Pitts] had very limited means to carry this out." The Investigative Project on Terrorism posted the FBI affidavit,  showing that "FBI officials saw Pitts as a 'dangerous' person who needed to be taken off the streets, and the affidavit introduced in Pitts' case clearly shows his enthusiasm for wanting to kill people." Julia Shearson learned that her name appeared on the "Terrorist Watch List" or "no-fly list" after an incident at the Peace Bridge in Buffalo, New York, where Shearson claims to have been stopped for no apparent reason. Jihad Smaili, lawyer and board member of KindHearts, a Muslim charity, has represented her in her effort to find out why she was stopped. "This is happening a lot in our community," said Isam Zaiem, a Westlake medical technologist and a founder of the Cleveland office of the Council on American-Islamic Relations. "Often, no one discusses it, because they feel ashamed. Julia, by doing this, she's really fighting for all of our rights." Julia Shearson speaks at the CAIR Republican National Convention Challenging Islamophobia Press Conference alongside Nihad Awad. In July 2016, Julia Shearson spoke at the CAIR RNC Challenging Islamophobia Press Conference alongside Nihad Awad and Imam AbdusSemih Tadese. Also speaking were Reps. Elijah Cummings, CAIR National Board chairman Parvez Ahmed, and executive director Nihad Awad. 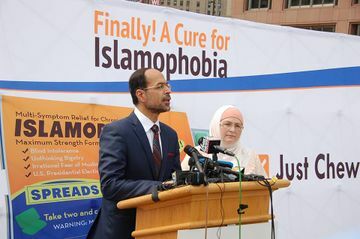 All praised CAIR for its dozen years of working to endorse, lobby and educate the American public and the country's leaders on the positive aspects of Islam and Muslims in America. Representatives from the Michigan chapter of the Council on American-Islamic Relations (CAIR - Michigan) July 2010 gave oral testimony at a special town hall meeting on racial profiling with government officials and civil rights attorneys at the Wayne State University Damon J. Keith Center for Civil Rights in Detroit. The town hall meeting, which was organized by the Rights Working Group and co-sponsored by CAIR-MI, had panelists taking testimony on racial and religious profiling from civil rights activists and community organizers. Panelists hearing testimony included U.S. Attorney for the Eastern District of Michigan Barbara McQuade, Michigan State Representative Rashida Tlaib, Michigan Civil Rights Commissioner Nabih Ayad, and Center for Constitutional Rights (CCR) Executive Director Vincent Warren. CAIR - Michigan Executive Director Dawud Walid and CAIR-MI Staff Attorney Lena Masri testified about growing constituent concerns regarding surveillance and misuse of confidential informants in mosques and religious profiling during re-entry into the United States. Walid elaborated on the chilling effect on Michigan Muslims to freely exercise their First Amendment rights to Freedom of Religion and Freedom of Assembly in light of last year's fatal shooting of Imam Luqman Ameen Abdullah in Dearborn by FBI agents based on a raid provoked by the use of confidential informants. CAIR - Cleveland Executive Director Julia Shearson was also in attendance and monitored testimony offered. This page was last modified on 5 August 2018, at 14:43.